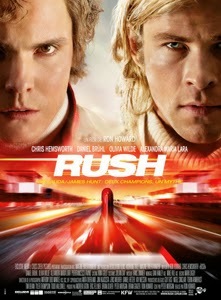 Rush proves that an intense, thrilling and impassioned true story can be made from the world of Formula One! In the mid-1970s a rivalry between two men gripped the world of motor sport, that of Britain James Hunt, and the Austrian Niki Lauda. The film begins with both men taking the leap from Formula 3 to Formula 1, and their fierce determination to win ties them into a personal battle for the World Championship. But how far will the obsession take them, when the sport’s dangers become too great? Formula One has a bad rap from many, especially when trying to construct a genuine story (memories of Stallone’s ridiculous Driven cannot be shaken) but Ron Howard has stuck the nail on the head with this film. While the excellent Senna was a well crafted documentary film, this is of an equal measure for a full dramatization. It heavily focuses on the very real dangers involved, stressing and showing the sort of shocking crashes and devastation that occurred before the sport became as safe as it is now. Chris Hemsworth plays Hunt, a racer with a rockstar’s mentality, good looks and womanising antics, who instantly falls for the glamorous lifestyle of Formula One, while his polar opposite Niki Lauda, played impeccably by Daniel Bruhl, is an intelligent recluse who finds Hunt’s behavior unbearable. Both performances are excellent, they radiant the confidence that these men must have had to commit to such a deadly sport, yet also carry massive personal burdens that discolour their lives as they rise to fame. Unlike Senna, which was quite biased towards Aryton Senna, Ron Howard’s film does its best to give each man equal footing; neither of them is a saint, and neither of them makes the right choice. At the end of the day, they are both foolish and brave in equal measure. The film’s direction of the sport’s intensity is spine-tingling. Formula One is, nowadays, often seen as drab and repetitive, but Rush does capture the ferocity of the cars and sheer lunacy of the people involved. Of course any Formula One fan must see this film, and of course they should know what significant event occurs during the story. While the film follows both men there comes a point where Niki Lauda’s story comes to the forefront and, compared to the rest of the film, it becomes so intense it is almost unbearable. In my local cinema some audience members were apparently sick, and I sympathise; the film’s intensity and style makes everything intense, but I’m sure a lot of it stems from this being real events, captured with grim reality. Will non-Formula One fans enjoy this? I think they will. It is a story worth telling, and it is a definitive rivalry between two very different men. It isn’t buried under Formula One jargon or rules (I… admit, as a fan, I could have used more of the sport’s structure being involved, a lot of the season’s races are summarized in montage too) so it won’t lose people. I can’t say anything bothered me to the extent of ruining the film for me. It is a beautifully crafted love letter to the sport as a whole, and captures the raw passion that it can hold (and one can argue, a passion it has lost). But one, one little thing… the soundtrack was a bit bland, and the credit roll proved it to me: Hans Zimmer, god, he really wasn’t the man for this film. I don’t want Batman/Superman music droning on and on here. But like I said, it didn’t ruin the film for me! Go and see it, especially if you are a fan of motor sport, this is a great interpretation of real sporting events with zero seams on show! Additional Marshmallows: Daniel Bruhl was so focused on delivering the performance truthfully, he was in contact daily with Niki Lauda asking him how he had felt during the events.